Step 1 Begin by making the basic galette dough. In a bowl, whisk together the all-purpose flour, semolina flour, sugar and salt. Add 1/2 of the butter and work the dough with your hand until the mixture resembles coarse meal. Add the remaining butter and continue to work the dough (the largest piece of butter should be pea-size). Now add the water and mix with your hands until the dough comes together. Flatten the dough into a disc and warp it with plastic. Refrigerate for at least 30 minutes. Step 2 Meanwhile, preheat the oven to 400 degrees F, and begin to prepare the apple topping. Step 3 Place the apple slices in a deep dish. Pour the rum on top and let it rest for 15 minutes, then add the sugar, cinnamon and nutmeg. Step 4 When ready, with a rolling pin, roll the dough out onto a lightly floured surface to form a large rectangle. Carefully transfer the dough to a large baking sheet lined with parchment paper. Step 5 Discard the rum in which the apples were soaking. Arrange the apple slices in two overlapping rows on the dough (see photo) leaving about 1-inch boarder. Fold the excess dough over the apple topping creating a frame. Brush the dough frame with the egg wash. Step 6 Finally, dot the top of the apple topping with the butter cubes. Place the galette in the 400 F degree-heated oven and bake for 30 minutes. Rotate the baking sheet then bake for 30 more minutes until the pie crust is golden brown. (To achieve the charred look of the apple topping, broil ever so briefly watching carefully to avoid burning). Step 7 Remove the galette from the oven. Let it cool before slicing. Step 8 While the galette is cooling, prepare the butter rum syrup. In a sauce pan, combine the brown sugar, water and butter over medium heat. Cook for 1-2 minutes until the sugar has completely dissolved and the butter melted. Reduce the heat to low and add the rum. Let simmer for 2 more minutes. Remove from heat and use warm on top of the apple galette. Enjoy! 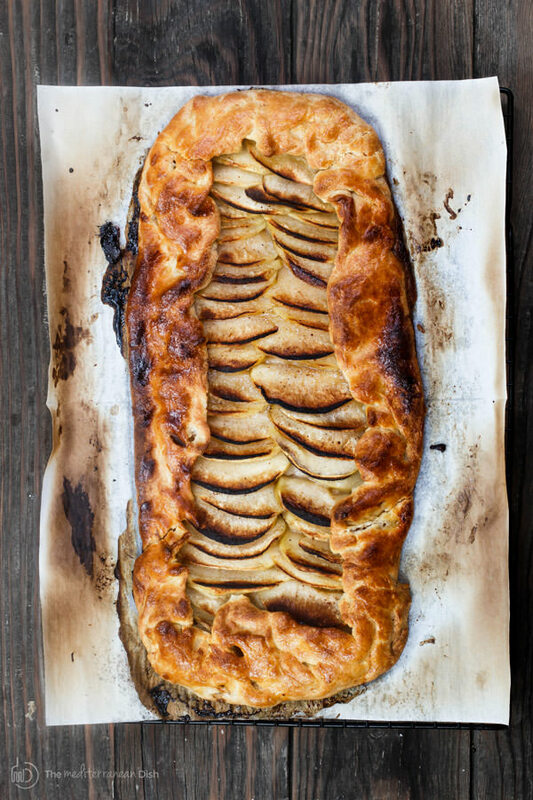 Bakers and non-bakers alike love a simple apple galette. This free-form pastry is easy, forgiving, and just plain cozy. I added a butter rum syrup because…why not? Let’s face it, I’d have this galette for dessert or even breakfast!